This is not the be all, end all, per se. If we find something more worthwhile to evoke during design we might shift our focus, but we need a focus. Given the nature of this set design project, it seemed only right to put this up to a vote. 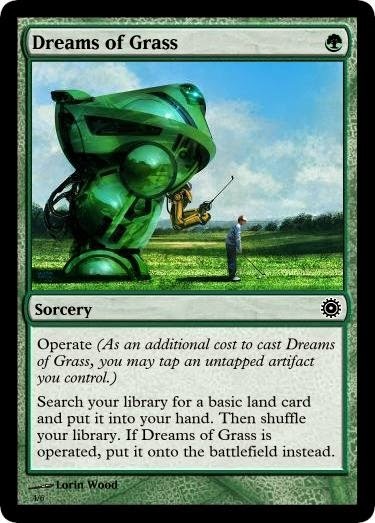 What follows are short descriptions of a few themes along with cards showcasing mechanical space we could weave into each. It’s not a 1:1 correspondence; many of these mechanics could show up in multiple incarnations of Tesla, and we could focus on any of these themes without using the mechanic listed afterwards. I repeat: We’re voting on the themes; these mechanics are merely an aid. Our first theme is possibility. Technology opens up new capabilities; transportation opens up new worlds; knowledge opens up new concepts. This version of Tesla is all about letting the players advance, feel free, and explore. Tesla #1 is about empowerment. Next up we flip Tesla #1 on its head: knowledge and exploration don’t always end well. Given the similarity in premise, this version could easily be folded together with Tesla #1 to get a head start on a more fleshed out theme. In Tesla #2 the advances of knowledge and technology make people feel invincible, but lead them to something more deadly than they imagined possible. This could be something like Lovecraftian Elder Gods, the rediscovery of magic on a plane that lost it, or disrupting some fundamental law of the universe. Tesla #2 is about condemnation. Our third option is another take on hubris as a source of doom. Technology advanced quickly, the future seemed bright, and then we lost control. Maybe there are self-serving mechanized armies, or maybe we just nuked ourselves. Whatever the case, technology has become the enemy. Tesla #3 is about survival. So the human condition is degraded, who’s to say that was unintentional? Maybe we were thrown under the bus by some of our own who saw a brighter future for themselves. Tesla #4 has two types of inhabitants: those who have transcended what they once were and those who were left behind. We need feelings of power and impairment; understanding and mystification; freedom and servitude. Tesla #4 is about contrast. Option number five is an exercise in conformity. Machines are emotionless, uncreative, and unadaptable. Many believe that technological advance is making us the same way. This version focuses on loss of identity, becoming another cog in the machine, and never questioning. Tesla #5 is about efficiency. All is justified in the name of advancement. It doesn’t matter how many people you crush in furthering your own goals, or what problems you’re creating for yourself down the line. It doesn’t even matter how big a risk you have to take to get there. We’re here to move forward and accomplish great feats. This version is home to workers and overseers. It is full of promise for those in power, and the rest have only rebellion as an option. Tesla #6 is about progress. Pick a theme. Where should we take Tesla? I’ve covered all the fitting themes I see how to flesh out, but if there’s another that’s not listed here which you’d prefer, say so. If enough people feel that way we’ll reevaluate, but if not then next week we’ll be ready to really get started. If we're going for a 'steampunk' set, we should be trying to capture some of the broad themes of steampunk alongside putting our own spin on them. Steampunk isn't simply cogs and corsets and goggles - it's also a social commentary, illustrating the divides created by the Industrial Revolution and the power that so much change can have on a society. Steampunk is inherently about the class structure, the Victorian politics as well as its aesthetic, and about the promise and perils of technology. It explores both sides of the coin - while the future isn't as bright without technology, technology is also easily exploited to widen the divide between the haves and the have-nots. Therefore, I vote #4 and #6 - the mechanics can easily be used for both sides of this conflict, and either of them can represent this extreme forward momentum resulting in extreme societal upheaval. "Unleaded" can represent the aggrandized purity of the upper class, but also the exploitation of resources, and the desperation of rebels. "Venture" can represent the risky and shady business of the captains of industry and machine barons, but also the all-in gambits of the do-or-die revolution. While I'm not sure either are going to be the mechanic we're looking for - especially Venture, as it means we'll have to pick between that or Galvanize - they are certainly capturing the themes of steampunk quite well. Class divides, societal friction, and oppressive industry, all engendered by the industrial revolution. I wouldn't worry too much about the mechanics here. Regardless of where we start we're going to find the best mechanics we can for our theme. Thanks for excellently summing up where things you expect and which pitches deliver them best. #1: I like the feel of this world a lot; it strikes me as more authentically steampunk than some of the bleaker options. 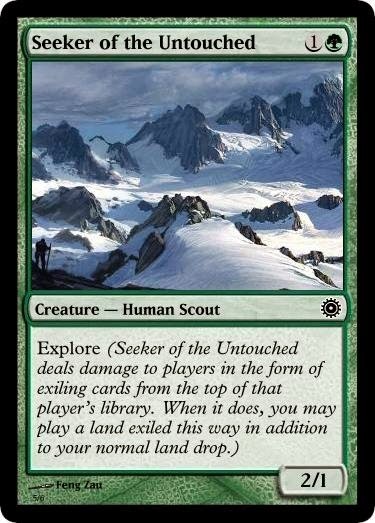 And explore is a cool and exciting mechanic, though I think the implementation deserves a little more careful attention than we've given it so far. In particular, I'd like to test a version that exiles in addition to damage rather than replacing it, or makes the damage-replacement optional at least. #2: I wasn't sold on this at first, but it's growing on me. 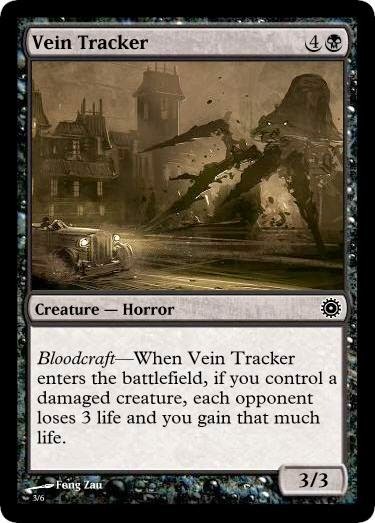 Bloodcraft has a lot of potential as a mechanic, and I like the idea (implicit in the description) that the artifact-y-ness and advancement of the world is something that is discovered (maybe dug up), rather than something inherent in the world like it is in Mirrodin. The main challenge for this version will be differentiating itself sufficiently from Rise of the Eldrazi, New Phyrexia, and Innistrad. #3: I hadn't anticipated the 'hubris' theme being paired with Operate, but I like them both a lot independently, so I'm very much on board with this idea. As a first set, Tesla's main role would be to establish that this civilization is overly dependent on technology. Later, we would probably need to introduce mechanical themes that show how civilization is falling apart as a result. #4: Because it hasn't shown up otherwise, I'd like to mention that this would be a good world in which to include the colorless-matters theme that several people have proposed. I do have serious reservations about this proposal from both a mechanical and a creative standpoint; it feels like it risks becoming too 'thinky' and static. But I'll admit that it is a solid option and would be among the easier ones to flesh out, and it's something that Magic hasn't really done before (Theros block probably comes the closest). #5: While I still believe that vehicles could be awesome if we can find a good, balanced implementation, this proposal doesn't do it for me. Simply put, homogeneity does not make for an interesting block, and this also feels like it's getting dangerously close to Mirrodin or Esper in its themes. #6: The creative description doesn't at all match what I visualized for Venture (I thought it would be something more like #1), but I'm gradually coming to think that it's actually a better approach. There are plenty of (unfortunate) historical precedents for justifying anything in the name of progress, and I think this proposal would give us the materials to build a really interesting and atmospheric world. The idea of a juggernaut that moves ahead recklessly and destructively is mechanically consistent with both Venture and Mecha, and sets up lots of potential for conflict. Fascinating and compelling proposals all around, but overall I think my vote is for #6. Oops, I just re-read the instructions at the top and saw that the worlds aren't tied to the mechanics. My opinion of the various worlds is more or less the same, however; I'd vote for #6 and secondarily for #1. Thanks for sharing nonetheless, these thoughts will be useful when we get to trying to pick our mechanics for whatever theme we settle on. 3, 4, and 6 all interest me quite a bit, because they feel like fascinating themes that could not be done in a world other than Tesla. My vote goes to #6 (Great Leap Forward/progress) because it gives us a clear conflict to work with as well as ideas about where to take all five colors. I certainly think 4 could be folded into it as well to make a really great world. I like 4 and 5. 3 and 6 are pretty good too. Not so fond of 1 and 2, but I don't hate them. My opinion here is mostly based on the mechanics I've seen. I like the ones that suit 4 and 5 the best, and the ones that suit 1 and 2 the least. While that's a defensible viewpoint, I'm pretty confident that we can come up with good mechanics for anything we pick, so if another idea really hits home for you I'd recommend you vote for it. Way I see it, the quality of the mechanics we've come up with so far indicates the quality of the mechanics we're likely to come up with later. I really think 4 and 5 have broad and deep design space, and I have my doubts about 1 and 2. For a theme I'm looking for a strong source of conflict and mechanical depth. #2 seems to offer the most interesting conflict. It's classic science fiction: the hubris of a humanity that dared to play god and meddle with powers they didn't understand. Green vs. blue/black. Could be even more fascinating if, instead of simply digging up doom, there's another faction at play trying to dig up salvation from said doom. 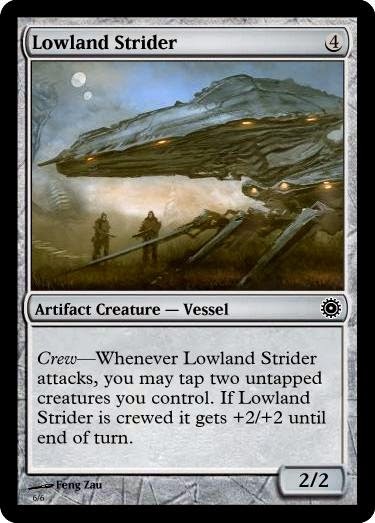 Mechanically I am nervous about treading too closely to Rise of the Eldrazi; I'm not sure a battlecruiser set would be the right feel for this theme. A world that can't hit the brakes of technological progress quickly enough to save itself needs to have a faster feel. #4 seems to offer the most mechanical depth. 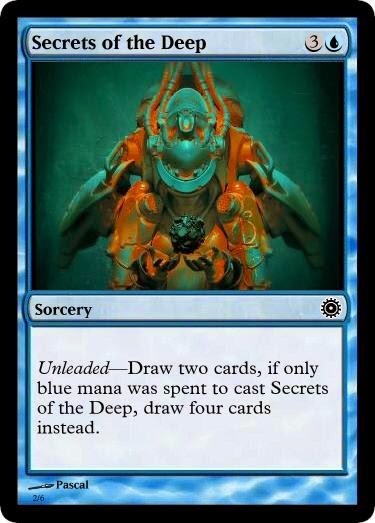 I don't think Unleaded would make a good marquee mechanic (it's pretty noninteractive and just tells you how to build your deck, not how to play your cards.) Nonetheless, the idea of transcendence and augmentation as well as the contrast between the engineered and the natural is fascinating, and Mirrodin hasn't hit that note. The other four themes don't interest me nearly as much. I really like the idea of #4. The ideological separation of the artifacts from the colors would give the set the factions it needs to have a conflict. It would make colorless matters and mono-colorless decks a chance to exist. I also like the concept of #6; could it be possible to have one color (blue, knowledge), or maybe two (black, power) enabling artifacts? That being said, I really like Unleaded, and can see it being used as a colored and colorless mechanic. I like 4 and 5 best. IMO they are not necessarily excluding each others either. 1 and 2 are just variations on Zendikar and/or Innistrad. I vote for #6, with #2 coming in a close second. #4 is appealing, but Esper and New Phyrexia have already hit those themes pretty hard. You're right, transhumanity has definitely been covered in broad strokes by those other sets. I think the important part of #4 isn't that there are transcended people, but instead that there is a contrast and conflict between the transcended and those 'left behind' and/or who fight it. Everyone on Esper was gung-ho for robot bods and metal men - and New Phyrexia was more about violation and assimilation, not the theme of progress leaving behind the many and advancing the few. That was my thinking as well, Inanimate, but HavelockV's definitely right that the setting will pop more the further removed we become from the overlap. I vote for #6, with #4 close behind. I think that these proposals have deep, resonant themes of class warfare, haves vs have-nots, and rich-get-richer, against an Industrial Revolution backdrop. Keywords or card names like Monopoly, Subjugate, Riot, Union, or Strike come to mind. #2 and #1 are nice too, but I'm not so excited about #3 or #5. YES: I like #1, Exploration and boundless possibility; and I like #4 and #6, which seem rather similar, the conflict between the transcended and the left behind, the technocrats and the underclass. NO: I don't like #2 - I think Lovecraftian horrors are overdone. I don't particularly like #3 as a starting point, though it's a plausible place to end up with in a second or third set. I'm not convinced by what was written about #5 but I could probably be persuaded. FWIW I definitely would like to see more discussion of the proposed mechanics too, and my feelings on the illustrative mechanics are rather unrelated to the themes they're associated with. I don't like Unleaded, I do like Operate and Bloodcraft, and I think some of the proposed Vehicle mechanics have a lot of potential. In defense of #2: Lovecraftian horrors are an example Jules used, not necessarily the specific theme underlying. The broader theme there, the dangers of unrestrained discovery and exploration sounds like a really interesting take (to me at least) on the ideas we've been building on so far. Yeah, I probably should have avoided that example entirely given that it's one we can't really use after the Eldrazi, but #2 can certainly be done a different way. As for mechanics, don't worry, we'll be discussing those plenty once we know what we're trying to evoke. My vote is for #3, with a side helping of #4. #1, #2, and #6 seem a little too open-ended, like they could fit into any generic fantasy setting (Antiquities? Zendikar?) and #5 just doesn't seem very interesting. #1 wants to be saved for a colonial new world. #2 wants to be saved for Innistrad 2 or something. #4 could work but still feels too much like Esper to me. I think some combination of #3 & 5 or 5 & 6 best hit a distinctly Steampunk theme that could differentiate Tesla from other sets. The difference between Esper and #4 is that on Esper, everyone was all for etherium and transhumanity - there was nobody 'left behind', no conflict, no question. Here, we get a chance to show the perils of progress, and explore the questions that transhumanity poses, and the conflcit between those who get to reap the benefits of progress, and those left in the dust to fend for themselves. I'd rather see the "transformed versus the not" theme when we return to a unified Alara and Esper interacts with denizens from the other shards. If we go with #4, I'd want it to focus on the moment of change, and the issue of who is to benefit from technological advancements. Technology brings power-- should that power be distributed widely, or reserved for a select few who use it to dominate the masses? That to me presents a more interesting conflict. For an Alara analogy, think "the moment etherium is discovered," not "Esper meets non-transformed folk." Good thoughts on overlaps. We certainly have more room for creative visions than mechanical themes, so it's worth trying to give each theme its best fit. I think 5 isn't getting enough credit with the audience here. It seems people are hearing about homogenized people and assuming that that will result in homogenized cards. Husks, Morph, Vehicles, Mecha, Cogs...they're all interesting, and they all suit that theme. I for one think that the "multiple parts combined into one whole" thing feels very mechanical and very artifact-y, and that the face-down creature stuff provides a really interesting way to show the loss of identity. So yeah, don't be so down on #5. I think many of the suggested themes can be integrated into each others. #5 can easily fit as a "counterpoint" to one of the other themes. #5 is definitely more of a 'subtheme' than a major compelling theme. Representing progress and its perils with the inhuman 'assembly line' is definitely a great expression of #5 that still fits into many of the other themes. How well does "loss of identity" fit a game designed around the existence of five factions, each of which are assigned a subset of the game's mechanics? That depends how we did it, but I don't think it's too tough. 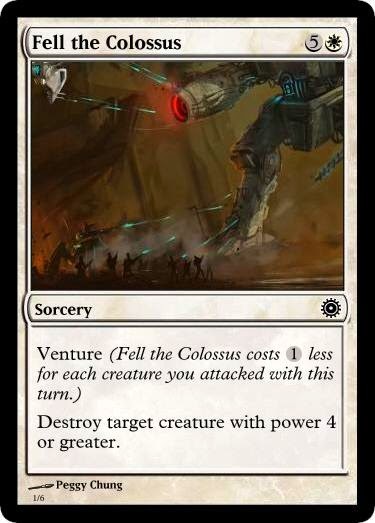 Imagine a mechanic (not that we'd want exactly this) where when the creature dies you get a colorless 1/1 token. All of the creatures can start as the vastly different things colors can do, but they all convey individuality being lost. Is is the best option? That's what we're deciding, but I certainly think it's doable. Well, colours aren't exactly factions, but...being subsumed into your faction is a loss of identity in itself. And cards can lack an identity of their own but be part of a greater identity. Mecha parts are a good example. And then there's stuff like Jules's suggestion. Plus clone effects and ability-wiping effects and other such things. I believe artifacts and artifact blocks answer Jenesis' question. We could take the same solution to colorless cards ala Morph or the Eldrazi. ~ deals 2 damage to target creature. If you subsumed, it deals 5 damage instead. Thank you all for sharing your thought processes about what you like and don't, the discussion's brought up a lot of hidden nuance in this decision. #3 doesn't quite seem to fit with steampunk and the like; the pollution and problems the Industrial Revolution produced usually ended up killing on a more personal scale, as opposed to the global environmental conscience that is much more recent. It is more cyberpunk than steampunk, isn't it? Have we actually committed to steampunk? Is that based solely on the set's codename? Probably we've just got some momentum on that, and given the number of ideas we have, it doesn't make sense to question it.